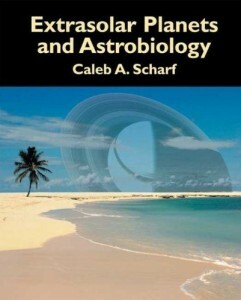 Caleb Scharf is Director of the Columbia Astrobiology Center and provides here a solid and mathematically-rich overview of astrobiology from a planetary perspective. Early chapters of Extrasolar Planets and Astrobiology deal with the astrophysical theory of star and planet formation and the basics of different exoplanetary detection techniques. As a textbook, Extrasolar Planets provides key mathematical derivations in the flow of the narrative. For example, Scharf demonstrates how to model the balance of forces acting on a spherical cloud of interstellar gas and how this collapses and fragments into stellar-mass clumps to trigger star formation. Supplementing this mathematical treatment for the classroom, each chapter ends with a few pages of example problem questions and exercises suitable for student study or assessment. These tasks range from mathematical analysis of a key process, to journal research and essay-style discussion of a topic to greater depth, or critical review of a paper. Extrasolar Planets is also very effectively illustrated with well-chosen images and diagrams, most of which have often been carefully adapted by the author to more perfectly complement the text. Given the title, this book is inevitably skewed towards the astrophysical and planetary side of astrobiology, but that is not to say that more biological topics are neglected. Scharf also deals with the molecular mechanisms of life, the environmental ranges tolerated by extremophiles, and the history of life on Earth. Curiously, however, for such a mathematically-rich book, the section covering biology (Chapter 5) is completely devoid of numerical analysis. Astrophysical modelling is undeniably more dependent on mathematics than biochemistry or microbiology are, but it would have been interesting to have included some key calculations. How many protons must an archael acidophile pump out of its cellular volume to push the internal pH from 0 to a more comfortable pH 3, say, (the answer is quite surprising!)? How do the rates of biochemical reactions depend on ambient temperature and how would that limit psychrophilic life? How much energy is available in different parts of the solar spectrum (taking into account the flux at different wavelengths) and why might organisms have evolved photosynthetic pigments with the peak absorptions that they have? Once both planetary and biological basics have been introduced, Scharf moves into discussing the interplay between the two and their astrobiological significance. Crucial interdisciplinary topics such as the evolution of atmospheric composition, the detection of biosignatures imprinted in the reflected and absorbed spectra, and the hazards to maintaining planetary habitability are all treated in detail. Extrasolar Planets is particularly up-to-date on the issues surrounding the possibility of life on non-Earth-like worlds such as Titan, Europa and Enceladus in our own system, and this is the first book I have seen to discuss in any depth the habitability of large exomoons orbiting gas giant parents. Extrasolar Planets and Astrobiology is a well-rounded introduction to exoplanets and their potential habitability, suitable for both newcomers to the field (including biologists wishing to learn more about the astro- side of astrobiology) and experienced researchers looking for a course textbook to recommend.